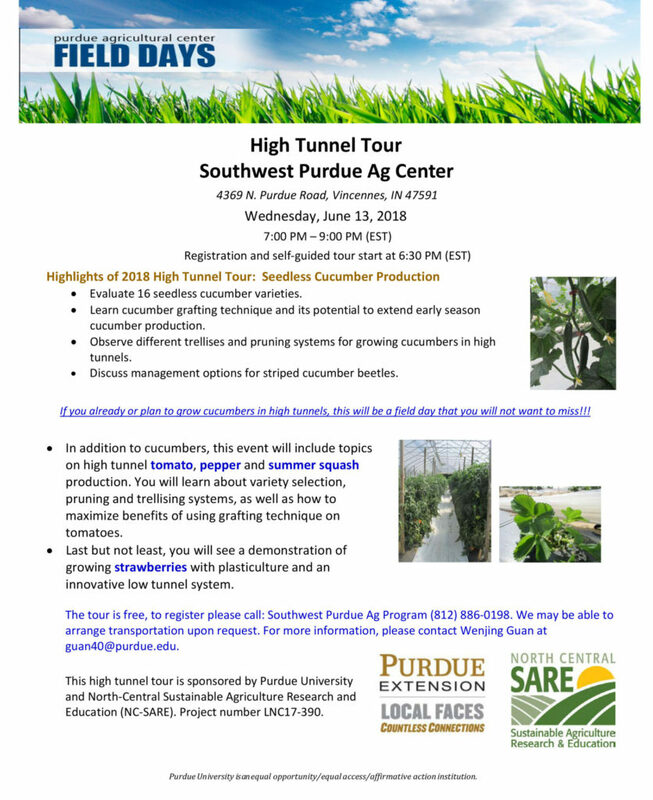 The SWPAC high tunnel tour will be held on the evening of June 13, 2018. Topics that will be discussed include: Grafting cucumbers for season extension; Seedless cucumber and summer squash variety evaluations in a high tunnel; Different pruning and trellising systems for growing cucumber, tomato and pepper in a high tunnel; Grafting tomatoes for improved yield; Cucumber beetle management; Annual plasticultural strawberry production with an innovative low tunnel system. Please contact Lori Jolly-Brown at ljollybr@ purdue.edu for more information about the field day. UVM Agricultural Engineer Chris Callahan, Produce Safety Alliance Director Elizabeth Bihn, and their colleagues will present the webinar on Monday, May 14 at 2 p.m. The webinar will include an overview of food safety regulations (coverage thresholds and compliance dates, FSMA, Produce Safety Rule) and broccoli-specific considerations, plus an overview of educational materials being developed through the Eastern Broccoli Project. Broccoli growers have particular sanitation challenges during cooling and icing, and all vegetable growers are looking for good water management and surface sanitation. Growers considering adding broccoli to their mix may need to make an investment in cooling equipment that meets recent sanitation requirements; this should be an excellent guide for making that investment effectively. You can find more details about the webinar and a registration form on the Eastern Broccoli Project blog at this link: https://blogs.cornell.edu/easternbroccoliproject/2018/04/24/produce-safety-webinar-for-broccoli-producers/#.Wt991uJmF04.twitter.